This room is, believe it or not, a closet. This closet/dressing room is part of a townhouse on NYC’s West Side. 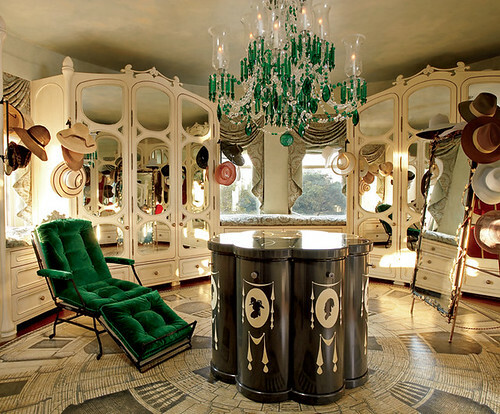 The house was decorated by interior designer Samuel Botero in a mad eclectic mix of all possible ornate styles, including Egyptian Revival and Biedermeier and art deco, at his clients’ request. The rest of the place is very dark velvet/chairs with paws/animal print/excess, but then suddenly in the middle of it all there’s this bright fantastical room which actually transcends the general madness of the house and achieves something mythic.